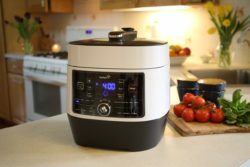 Yesterday’s pressure cookers could be a little scary and fortunately they’ve been redesigned and are perfect for camping and RVing meals you’ll all enjoy. If you’ve never used one you should give it a try. You’ll be amazed at how delicious and fast your meals come out. They no longer rattle and spit the way they used to. Today’s pressure cooker is quiet and efficient. You can cook a roast with potatoes and carrots in about half an hour. There are models available that will replace your saute pan, crockpot, and rice steamer, and canner too. They have been made to save energy and infuse your food with flavor. The food that is cooked in a pressure cooker is said to be more nutritious. That is because the food doesn’t need to cook as long as it does in a standard small appliance. The nutrients are maintained in your food instead of being cooked out. They are affordable as well. You’ll appreciate the small footprint and the reduction of other kitchen appliances. Today’s pressure cookers really work well for RVers. They won’t heat up the kitchen and don’t take up much space. You’ll free up your stovetop space for other things. These are just some of the benefits you’ll enjoy when you cook this way.